Because I’m ballsy, I don’t give in and chop my locks. 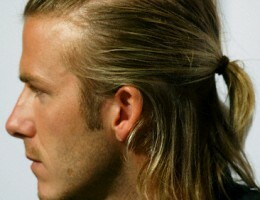 Besides, if you really want to know the truth about it, long locks were once a symbol of the ruling class. So there you have it – most people don’t even realize it and I wouldn’t dare confess it anywhere else except here on a secure LAN connection at McDonalds. I looked outside and there’s no Google Street View droid down below sucking on my fibre cable. But like everyone else I gotta work. I know, I know, but now there’s an even BIGGER problem: MY PONY TAIL IS KILLING ME!!! The little black thingy I borrowed from my girlfriend to keep my head in check keeps whipping around to yank the hairs out of my scalp and I’m like screaming in agony. And now my boss, Henry Fargo, is used to my pony tail. I’m considering shaving my head. I guess pony tails aren’t so simple. This entry was posted in Ordinary People and tagged Google street view, long-haired white man, my pony tail is killing me, Ordinary People, pony tail probs, the brutal times. Bookmark the permalink.